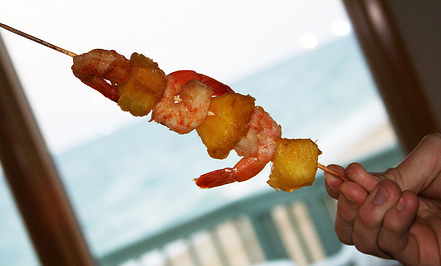 Arrange shrimp and pineapple on skewers and lay flat in a casserole dish. In a small bowl, combine juice, EVOO, honey, garlic, and soy sauce. Reserve a bit for basting and pour the rest over the skewers. Cover and refrigerate ~ 1 hour. Previous PostWhere oh Where has the Warm Weather Gone?